Originally published in 1999, Flat Lake in Winter has recently been released as an unabridged audiobook performed by George Newbern. 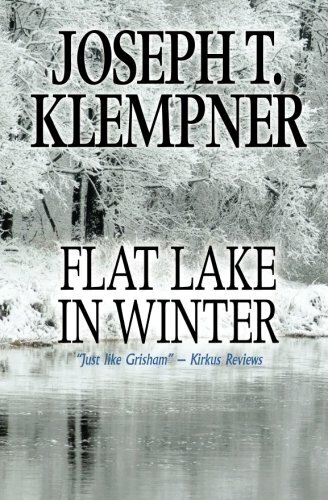 Klempner's novel is a well-crafted mystery with strong psychological themes set in the small towns of the Adirondacks in NY State. It is written in the style of a true crime non-fiction account, adding lots of detail about the characters, as if collected from interviews and evidence collecting. There are only a few moments where we enter into the minds of the characters and get details about private lives that make it clear from the internal narrative that this is a novel rather than a non-fiction account, as the plot takes some unexpected developments. The story starts with the brutal murder of an elderly couple. The only person around is their grandson, Jonathan, who is the one who calls the police, but it turns out that he is covered with blood. He has developmental delays and does not understand much of what is going on around him. He gets detailed and charged with the murder, and the local authorities want the death penalty. This means that he is entitled to a well-paid defense in New York, but in this remote area, there are not many contenders. Reclusive lawyer Matt Fielder gets the job. He is a dogged investigator, which is a good thing, since there is a strong case against Jonathan. Fielder explores many aspects of the case and Jonathan's often unhappy life, and gradually is able to mount a surprising defense. This is a very pleasing novel that covers both factual issues such as the legal status of the death penalty and psychological issues that can provide a legal defense for murder. There's a love interest too, which rounds out the story. The book is just as interesting as a portrait of small town life. The reading of the audiobook by Newbern is very engaging, providing the appropriate neutral tone for a work that is meant to read like a work of non-fiction, but also making the characters appealing.